India is the fifth largest retail destination in the world and is the most lucrative market for investments of any kind. The retail scenario in India is evolving by the day, home retail is one such segment that has emerged and added to the potential of the retail sector, by shifting from a wholly unorganised market into a full-fledged organised space. Organised Home Interior market is estimated to be worth USD 9 billion and is continuously growing at the compound annual growth rate of 15-20 per cent. The emerging modern retail categories are home improvement, speciality furniture, and speciality furnishings. These categories contribute a significant business to the overall home retail sector. Furnishings contribute 15 per cent, Furniture contributes 50 per cent, bathware contributes 15 per cent and modular kitchen contributes 20 per cent of the business. On one had we have furniture markets at places like punchkuyina Road, Delhi selling genuine and sturdy furniture at low prices. On the other we have players like Evok a part of Hindware Home Retail Ltd, Home Centre by Lifestyle, Home stop by Shoppers Stop, Home Town by Pantaloons and also Ebony Gautier by Ebony Retail Ltd. It’s a big challenge for organised retailers to penetrate deeper into the market and create a space of their own. However, hoping that for every opportunity there is an audience they are vying to grab a major market share. What makes these stores different from the traditional shops is the way they display their products and also they house everything under one roof. “Firstly we have taken a lot of efforts to give a feel-good charm to all our stores. We have imparted the international look to furniture or a home décor store in India. We have created an atmosphere where a customer can come, feel, touch and experience our products” says Parekh. 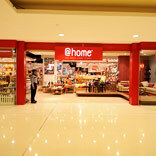 The home stores are divided into sections like you divide space in your house. You have a dining area, a living area, a kitchen, a bedroom, a kids room, bath space, study, office and so on. The sections give you visual experiences of how would your house look, which makes deciding on the interiors much easier. These stores have different formats and sizes. Depending on how and what is there to display the size of a store varies. If it has home décor items like lamps, vases and smaller furniture the area requirement is less and if the product portfolio includes the complete solution with beds, bath and kitchen accessories, it becomes a mandate to have bigger stores. Evok speciality chain has three different formats covering living, kitchen and bath domains ranging from 8000 sq. ft to 30,000 sq. ft in size. @home store size goes from 7000-18000 sq. ft. with an investment of Rs 2.5-3 crores per store, but recently they have opened their flagship store at Chennai, which covers almost 33000 sq ft of area. Roseby’s is into smaller stores with store size between 300-1000 sq. ft. and Hometown by pantaloon gives extravagant shopping experience with store sizes between 125000-200000 Sq ft. The future sure looks promising, but yes it doesn’t mean that unorganized player will fade off, they will always be part of the home décor business. Evok has five stores in Delhi NCR and is planning to launch 50 stores in the next three years. “We are also looking forward to opening our exclusive kitchen and bath range called Turnkey Solution” says Jairath. Talking about the company’s future plan Parekh says that they will open four to five stores per year. Evok is coming up with its flagship store in NCR and the store count will eventually be scaled up on a pan-India basis with the retail footprint of 1.2 million sq. ft. and the target turnover of Rs 400 crore over the next five years. Everyone wants a beautiful home and they will go to any extent to get one. This gist makes home retail a sector worth investing in!